This is the shelter list's weekly newsletter. The weekly newsletter to the group is usually sent out on Thursdays. If you know of any items you believe should go into next weeks newsletter please email Darlene at Woofs52@aol.com for consideration. Thank you! We do try to make sure the information on this newsletter is correct and accurate, however we may make mistakes with information and/or website address. Please forgive us for our errors if any. A BIG thank you for Darlene for finding the time to keep the newsletter going! directly to the group. Thank you. 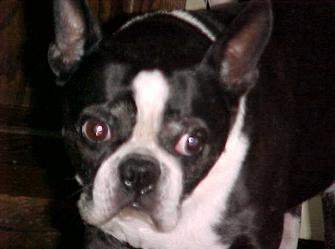 Oklahoma City Boston Terrier Club, Inc.
Birmingham Boston Terrier Club, Inc.
up fast. Any questions, please email mhowe@radiks.net or call (515)993-3519. Now available through BTRN are these adorable Boston Terrier Wooden Totes. They're hand made out of pine and available in your choice of stain colors. Choices for colors include: wine, navy, hunter green and natural. but are approximately 8" x 8" x 20". FUND RAISER FOR MERRIE'S MEDICAL. Hand Painted & signed by artist Roie. euthanized. She's around 10 yrs old and has a fatty tumor on her upper chest. is affecting the movement of her shoulder. She is a loving dog who really tries to keep up with my boys, and Rosie. see who we are helping! surgery on Nov. 17 to remove what they can. Please keep Lucy in your prayers. part to fight animal abuse and she desperately needs your support! THIS IS AN URGENT SITUATION!!! There has recently been a rash of dog thefts in and around Lake County, Illinois. This is north of the Chicago area. Dogs have also been stolen in southern WI, which is in very close proximity. These theives are BOLD, they are stealing these dogs right off owners property in broad daylight. One report has them driving a white van with back windows. So far, reports of several stolen Great Danes, a Collie, and also Debi Grunnah's beloved Anatolian Shepherd, Beefy. The Grunnah's are offering a $5000 reward for the arrest and conviction of these individuals. It is believed, but not confirmed, they may be associated with a dog fighting ring. you can be of any assistance, please contact Debi ASAP! !